Nothing compares to the aroma of bread baking in the oven. 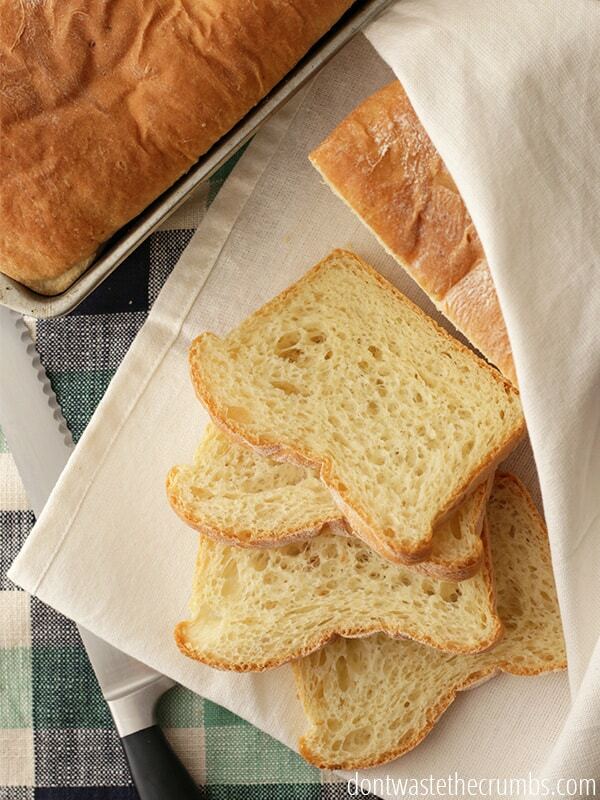 For a couple quarters, you can have homemade bread ready in time for lunch. 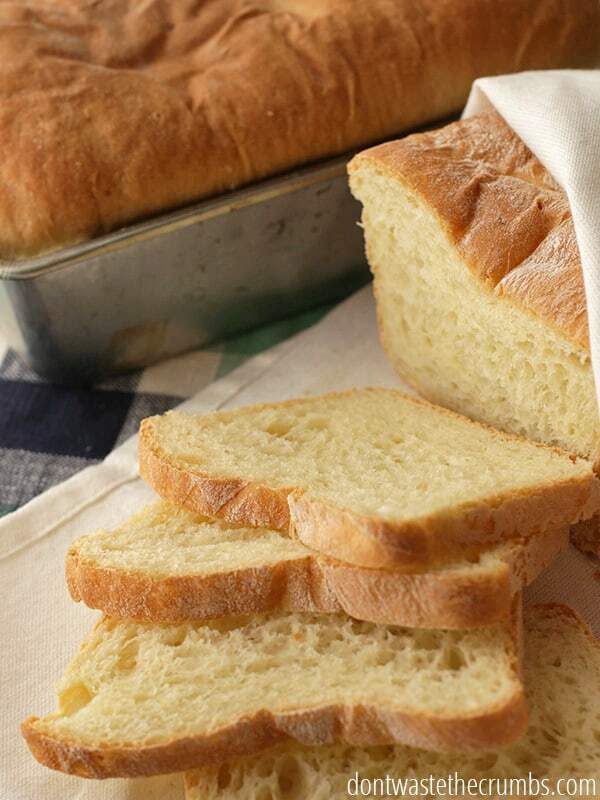 Homemade bread is a simple and delicious way to treat your family. It doesn’t take all day to make bread and it’s very economical. A typical loaf of buttermilk bread (or potato bread) will cost you $3.50 in the store. You can make this entire recipe for $1.50, making each loaf only 50 cents! This recipe uses potatoes, which are more than likely in your pantry (or my garage), and buttermilk. I personally don’t have buttermilk in my fridge often, but when I do, I have a lot. I can’t seem to find buttermilk in the stores in a smaller size than quart, and often times the recipe only needs 1/2 cup or so. Now I’m secretly looking for buttermilk recipes, just so that I can use the rest in Potato Buttermilk Bread! Have all ingredients ready at room temperature. Bring a small to medium pot of water to a boil. Boil potatoes until done. Add hot potatoes and butter to a mixer and stir well. Add yeast, buttermilk, 2 beaten eggs, sugar and salt and mix well. When the dough has doubled in size, grease two 9 x 5 inch loaf pans. Punch the dough down, divide in half and form into two loaves, placing them seam-side down in the pan. Cover with plastic wrap and let it rise again at room temperature until almost doubled in size, about 1 to 1½ hours. (If you don't have loaf pans, you can free-form an artisan loaf on a cookie sheet). Preheat the oven to 375 degrees. Brush the top of the loaves with the single beaten egg and bake the loaves until they are golden brown and the bottoms sound hollow when thumped, about 40-45 minutes. Allow to cool for at least 30 minutes before serving. Bread can be wrapped individually in freezer bags and stored for future enjoyment! 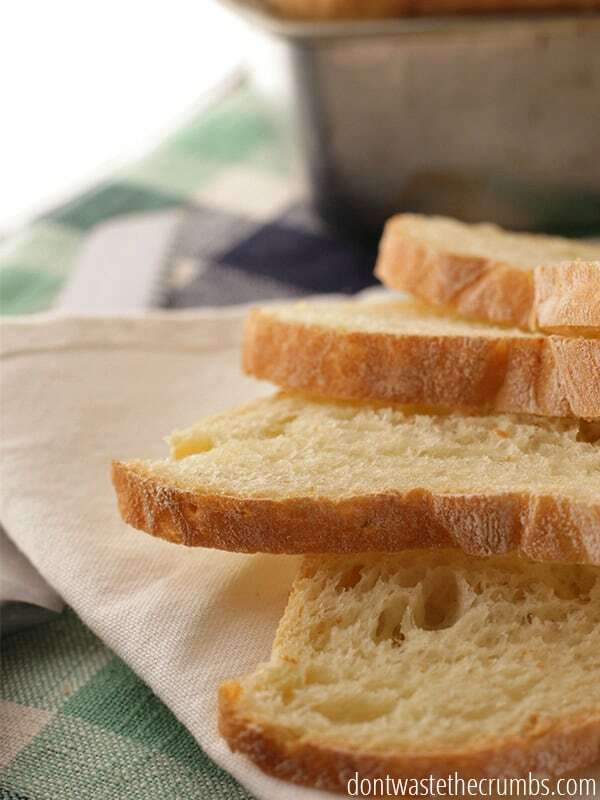 How do you enjoy freshly baked bread? This is my husband’s favorite bread and yours looks amazing. I want to make it as soon as our temperatures drop a bit. What amount of potatoes is that in a measuring cup? I plan on using instant (too hot-over 100 here). It’s about 3/4 cup. You have my sympathy on those temperatures!! I think this is my husband’s new favorite too! Tiffany, I enjoyed reading your article on sourdough bread. I have been baking bread most of my adult life, but I’m venturing out into new things. You can buy powdered buttermilk at the store. It comes in a 12 ounce plastic container. It is Saco Pantry Cultured Buttermilk lend. I have used it for year because my children loved buttermilk biscuits. I use dry buttermilk for biscuits, pancakes, fritters, etc…it will work just fine for bread; mom used to make potato bread, no buttermilk; she used leftover mashed potatoes from a meal….dividing 1.50 equals .75; homemade bread or anything you make from scratch is better for the body and avoid nitrates/nitrites like they are poison…they are. Yay for homemade bread! And without the bread machine…I was beginning to think I was alone in my old-school practices! Haven’t tried a potato bread…will put this one on my list of to-makes! LOL, you’re definitely not the only one who doesn’t use a bread machine! I sometimes wish I had one, especially for the simplicity, but the end results are worth the effort when doing it by hand. The bread looks great! Your photographs really feature the bread well. Thanks for the recipe! Thanks Lisa! I’m a novice photographer so I appreciate the encouragement! This is something I definitely must try! Sweet potato sounds like a delicious alternative. Thanks for the idea! I’ve never considered regular milk and vinegar – thanks for the tip! Lemon juice will work too! Actuslly, I have a question too. Does this make two loaves or three? Because at the top you say it works out to 50c from a cost of $1.50 total, so I assumed three, but then in the directions you say make two loaves. As written Debs, the recipe can make 3 average loaves. I wrote 2 in the recipe since most people only have one or two loaf pans. But those two loaves are REALLY BIG, and I usually split the dough into thirds, then make mini loaves with the third portion just to keep the loaf size normal. Ah gotcha! Think I missed the subtleties cos I was reading late at night! If you are making 2 loaves and one mini loaf, about how long do you cook the mini loaf? Thanks for sharing that tip, Sue. I wanted to make this recipe today, but was out of buttermilk. Now I can, thanks to your tip. Thank you Tiffany for sharing your delicious recipe. I know my family will love it. I,also had a problem with using up milk before it went bad. I switched to using the powdered buttermilk in the can and it works beautifully!You just mix it with water.Solved the whole problem and can’t tell the difference. I do a LOT of baking so I know. I read somewhere that you can freeze buttermilk and it works. Now mine never goes to waste. Plus it lasts a long time in the fridge. This look so good! I think I’ll have to pin it now. 🙂 I use vinegar and regular milk as a buttermilk substitute too, it works like a charm. Thanks Missy! I hope your family enjoys it as much as we do (it’s now replaced our “normal” bread recipe, lol). This looks like a great recipe. I love potato bread. =D MY hubby is really into bread making right now, so I’m going to pass this on to him . =D I would love for you to link up at Sweet Sharing Monday! Saw this from Cast Party Wednesday – I love potato bread! Pinning so I can try this later. I have the same issue with buttermilk so I’m always on the lookout for recipes that use it too, lol. Thanks for sharing the recipe. I can just smell this. Bread is my ultimate pleasure! Please come share on my linky party. I LOVE potato bread and this looks amazing! Thanks! I’ve been wanting to start making my own bread instead of buying it. It really is so much more economical, and tasty! This looks like a great recipe to start on! Oh, it truly is more economical. I plan to detail this fact next week! This is the best looking bread that I have seen in a while, I can’t wait to try a slice of it. Hope you are having a great week and thank you so much for sharing with Full Plate Thursday. I currently have a goal to have a loaf of bead made each day, which shouldn’t be too hard since I have a breadmaker (that I got from the thrift store). Thank you for this recipe. We make pancakes or aebleskivers with leftover buttermilk or make Irish soda bread. Thanks for linking up! I love homemade bread! This looks yummy! Thanks so much for sharing at Terrific Tuesdays. Will look forward to trying this recipe! I LOVE potato bread! This looks so yummy! Can’t wait to try this recipe. Thanks for sharing at the Pomp Party! Pinning to our Pomp Party board! I’ve never even heard of potato bread. Looks wonderful. Thanks for sharing this week on BeColorful. Saving this recipe for fall / winter baking 🙂 Thanks for sharing it. Hi Tiffany. Congratulations. You got the most clicks for this delicious recipe and it is being featured, this week. I can understand by looking at the photo, why people would be clicking to find out more. This is a must try! 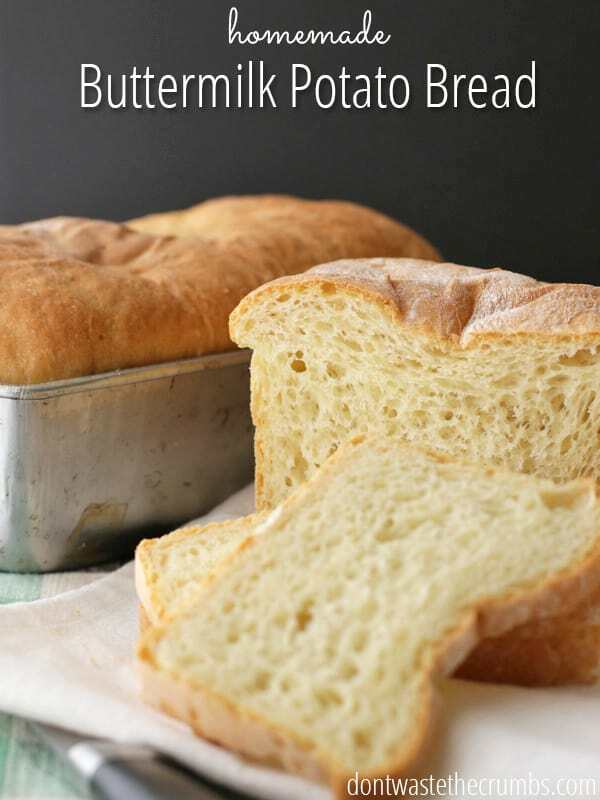 I love making homemade bread and haven’t yet made one with buttermilk, which I love to bake with, but I am definitely going to try this one. Thanks so much for linking up to Creative Thursday last week. I can’t wait to see what you link up this week. Have a wonderful weekend. The header for the recipe says that it makes 3 loaves, but the directions say only 2. Can you confirm the yield on this recipe? This recipe should make two loaves. Perhaps my loaf pans are smaller, because when I split the dough in half and put it into my pans for the second rise, there wasn’t enough room in my pan for each loaf to double in size. So I re-kneaded the dough together and split it into three to better fit my pans. I hope that clarifies! Thanks for what looks like a great recipe. Have always loved potato bread, and made it, however, it never was anything special. This sounds very good, and never thought of using buttermilk. I think buttermilk is the key to this particular recipe – a delicious, warm tang with each bite! Thanks for coming by Carole! I’m glad you’re enjoying my blog! I have a friend who’s been experimenting with homemade bread and wheat flour. She’s found that when she uses whole wheat flour for the entire recipe, her dough doesn’t rise well. But, when she adds just a bit of vital wheat gluten (1 Tbsp per 1 cup flour), she has a successful and beautiful rise. I don’t know what your specific plans are for the recipe, but here’s some advice in case you need it! This bread recipe was so easy and very delicious. Made two huge, beautiful loaves. I think next time i will try splitting the dough into thirds and making rolls with 1/3 of it. Thank you Tiffany. How wonderful that you and your family enjoyed the bread! Definitely large loaves, which is why I split them into 3rds as well. You’re very welcome Ann Marie! When I buy buttermilk, I use what I need and then freeze the leftover milk in an ice cube tray (measuring as I fill). Then it doesn’t go bad and I can thaw only what I need for the next recipe. Ooh, I hadn’t thought about that! Great suggestion Pam! Hi June! You could probably follow the instructions given by the machine manufacturer, just use the ingredients listed in the recipe. The order in which ingredients are added to machines is sometimes different, and I don’t know what yours says, but it’s certainly worth a shot. Worst case you’ve got very yummy croutons! Looks great, but my dough was very sticky and messy…not at all a joy to bake with. I did 61/2 c flour. What am I doing wrong? I’ve wanted to make my own bread but always seem to fail with the dough and just give up later. I can’t know for sure what went “wrong,” but one tip off-hand is to drain the potatoes well before adding to the butter. Also, sometimes altitude and temperature play a roll in making bread and more/less flour is needed. You could add in half the flour at first, mixing really well, then letting it sit for 20 minute to absorb moisture, then continuing with the remaining dough 1/2 cup at a time. In my own experience, adding 1/2 to 3/4 cup more flour won’t change the outcome much, if any. Add 1/4 cup at a time, letting it fully incorporate into the dough. Sometimes it only takes a little bit before the dough “magically” isn’t sticky anymore. Weird I know, but I’ve been in that place before many of times! I make butter from raw milk – do you think the leftover ‘buttermilk’ would work? It’s quite different from store-bought buttermilk. Actually Misty, that is how you get real buttermilk! When the fat coagulates and separates from the liquid, that’s the buttermilk! I’d use that liquid and give it two thumbs up. Now, if you’re rinsing the butter and you’re getting more buttermilk, I’m not sure I’d use that part. It would have to depend on how acidic and thick it is. But the original stuff, go for it!! Made this bread and it is awesome! I have been using my bread machine, what a nice change to make from scratch. It’s one of our favorites too. If you have any, try subbing sweet potato instead of white and using maple syrup as the sweetener. It adds just a slightly different sweet flavor that is SO good! Hi! Thank you very much for this recipe. I’m (quickly) making my way through the 22 day challenge. I’m very encouraged to cut our grocery bills in half, and at the same time feed my family healthy real food. My husband loves that I’m ready to make the switch to whole fat milk now! Do you know how I could used milk and vinegar to make this bread? What ratio of vinegar to milk to substitute buttermilk? Thanks! I’ll update the post later so everyone can see it. 🙂 Welcome to Crumbs! I look forward to seeing more of you! Thank you so much for this recipe. I have to say I was a little scared of making bread from scratch. I have a bread maker that someone gave to me years ago but it doesn’t get used often. My five year old helped me make this bread yesterday and it was great. We made two small loafs and one bigger loaf and one is already gone. I can’t wait to try some of your other recipes. I am dying to try this. Forgive me if I missed in in the feed somewhere but what kind of potato should I use? Two russets vs. two white potatoes would be a big volume difference…I don’t want to mess it up! Hi Lori Ann! I used small russet potatoes, but you can use white ones too. 3/4 cup of cooked potato is about the equivalent of two small white potatoes… so small, but not fingerling size. Maybe 2-3″ in diameter? You can always cook them and then add to pancakes, or even freeze for later (just warm before using in the recipe). Fantastic Melissa! I too had the same feeling as you when the bread rose… “my goodness, will it fall over? !” LOL! I’m so pleased your family liked it. My husband just requested this recipe yesterday… and some extra butter sounds delicious!! Hi Melissa! I’ve made it with 50/50 white/whole wheat, but not yet with spelt. I bet it would be yummy though! We have LOTS of potatoes that need to find a home, so if we make this, I’ll be sure to test it out with WW and spelt. I even have kamut! My bread made me laugh when I pulled it out of the oven. It rose SO high! It is still cooling on the racks. I hopped on here to make sure I used the right size bread pans. Should I have punched it down more, or not let it rise as long the 2nd time? It rose even more while being baked. I am SO thankful for all of your work, Tiffany. I am excited to cook for the first time in a long time! Quick question. Are the potatoes cooled when you add the yeast? I would have thought the hot potatoes would kill the yeast. Looks delicious! Thanks! I just made this and it turned out amazing, so soft and delicious. We even tried it with some Brie cheese in the panini machine and it was incredible. USE CULTURED buttermilk, and you can top it off with milk or cream to keep it going and it will lasts months. Ignore the date on the bottle, as long as it does not have mold it’s good. You see, cultured buttermilk is like sourdough starter, it’s a symbiotic culture of good bacteria and yeasts… if you feed it then it just keeps on going and stays good for months. If you see mold, or if it smells rotten (not sour but rotten) then throw it out. But otherwise, a half gallon just keeps on giving. Use 2 cups, add 2 cups of milk back to the jug, shake and put in fridge. This only works with CULTURED buttermilk but you can find it at most any store. How’s that for a budget friendly option. Milk is much cheaper than buttermilk, and so by topping it off you save a lot of money. Also, the culture in cultured buttermilk is pro-biotic and is the same as in yogurt, kefir etc so use it to make pancakes, breads, smoothies etc. You can look this up on line as well, “how to culture buttermilk”. Hi Tiffany, I do hope you see this, you posted this a long time ago. Your potato bread looks just fantastic! The color and so hole-y (spongey, in a delectable sense) and light. I want to make this so much. I am not not that experienced. Wondering how you measure your flour? A cup of flour can be anywhere from 4.25 oz to over 5 oz depending on how you add flour to the cup. Then over 6-1/2 cups that can be a big difference in the amount of flour used and final texture of the dough and the finished bread. Would you please give me an idea how you measure flour, fluff in the bag and gently spoon into cup and level or dip into bag and level? Or better yet how much weight of flour. Thank you so much! Hi Smita! I scoop my flour in my measuring cup. I know that’s the “wrong” way, but it’s just the way I’ve always done it! For bread, always start with the smaller end of measurement for flour, then add more as needed until you reach the right texture. For this recipe, you want the dough to be tacky – meaning you can stick your finger into the dough and your finger comes back w/o any dough attached. There will be a slight indentation where your finger way. I hope this helps – enjoy the recipe! You’re very welcome Smita! Glad you enjoyed this recipe! I have a question, and hope you be gracious enough to reply. 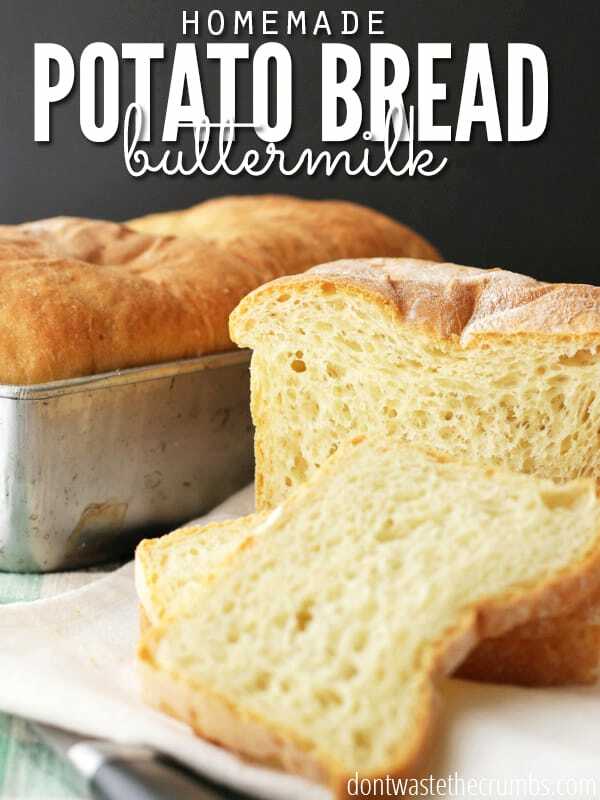 Potato bread buttermilk milk bread recipe looks perfect fo what I want to make. My question, may I substitute dehydrated potatoes for this recipe. ? I truly appreciate your advice and, or, direction. I haven’t tried that myself Judith, but if you reconstitute the dehydrated potatoes into mashed potatoes, I don’t see why it wouldn’t work! I presume my comment did not get posted or I failed to hit submit; taking $1.50/2 is $.75 but onward to better things…there is dry buttermilk; I use it in everything that is like a bread; you can also, as above, use lemon and/or vinegar to get the same results…this may be better known as sour milk not buttermilk…there is a difference but heah if it works so much the better. Mom, now gone, God bless her, such a hard life trying to feed us and being dirt poor…if there were leftover mashed potatoes, (we only saw those if uncle brought a large bag to us), she used the leftovers in her bread…that is how I discovered potato bread and how yummy. Someone mentioned save the crumbs..indeed!!!! On an off note..I take left over chips of any kind, roll them into a fine coating mix and use it on whatever meats I am going to broil, bake or fry. Hint for safer/healthier body…avoid nitrates and nitrites like they are poison..they are.